The clean lines of these contemporary planters contrast well against the soft contours of box balls, bamboos, phormiums, hostas and grasses. Alternatively, set off their shiny surface against the shimmering silver foliage and purple flower heads of lavender or verbena. Made from steel, electroplated with zinc galvanising. The planters come with a central drainage hole: a bung is supplied, but we can’t guarantee that the planters will always be 100% watertight. They are lightweight and easy to move and will age outdoors over time. Please Note: dimensions given for the 30cm and 40cm planters are approximate. If you require an exact size, please call us and we will measure them prior to dispatch. Thanks to Mr G for this great photo of the X-large size planter in his garden. 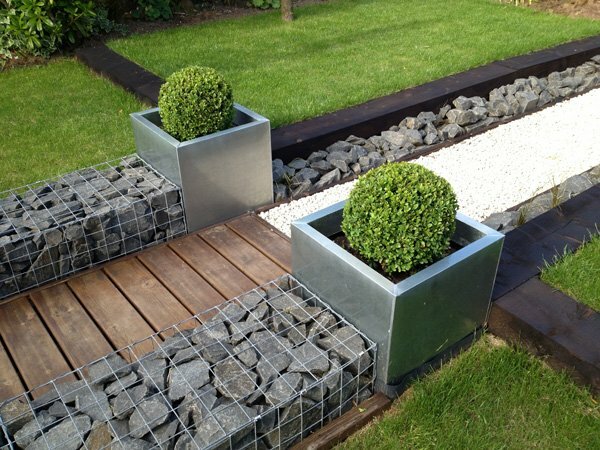 We love how the planters have been integrated into the wall, what a great idea! Thanks to Andy B from Berkshire for these great photos of the large sized planters in his garden. Thanks to Mrs W for the stunning photo of her medium-sized planters. "Easy to ring and talk to thanks"
"Love them, they look great outside out garden cabin"
"Got 4 on sale so worked out at £5 ea"
"Welded seams down each corner which are not clearly visible in their images." "Welding finish not as good as I would expect"
"Nice cubes but a little small"
"One of the cubes had a small dent in it. Could not be bothered to send back I just position the cube so you could not see that side of it."